From left are Ed Brown, Chip Avera, Travis Turney, Sheriff-elect Darrell Young, James Davis, Bruce Kirby and Matt Goney. Six law enforcement professionals will join Cannon County Sheriff-elect Darrell Young when he assumes the office on Wednesday. 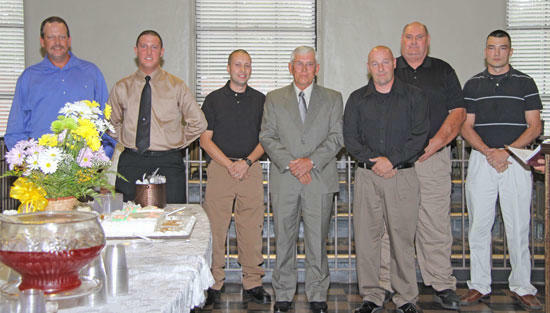 They were sworn in Monday night by Circuit Judge J. Mark Rogers during a ceremony at the Cannon County Courthouse. The new sheriff's department employees are Bruce Kirby, who will serve as chief deputy; Chip Avera, deputy; Travis Turney, deputy; James Davis, investigator; Matt Goney, investigator; and Ed Brown, jail administrator. Young said Monday that his first order of business Wednesday will to get his new administration in place and to conduct an inventory of the sheriff's department. Young has spent the last few weeks attending the sheriff's training academy. "I have learned it is an awesome responsibility being sheriff and I have a lot more to learn," he said. Young said he planned to keep the promise he made to voters when running for office to be a "working sheriff" from Day 1. "I'm going to be out there with the people as much as I can get out of the office. I'm police, not a politician," he said. In a related move, the Courier has learned that Patrick Fann has left the sheriff's department as a deputy, and will begin work for the Woodbury Police Department on Friday. I don't know about the other guys, but I know Chip Avera will make an excellent deputy. He is a very fine young man! Good luck Chip! Ed Brown is also an excellent man! Good luck to all! Chip is awesome. Glad to finally have him back in Cannon County where he belongs!! !